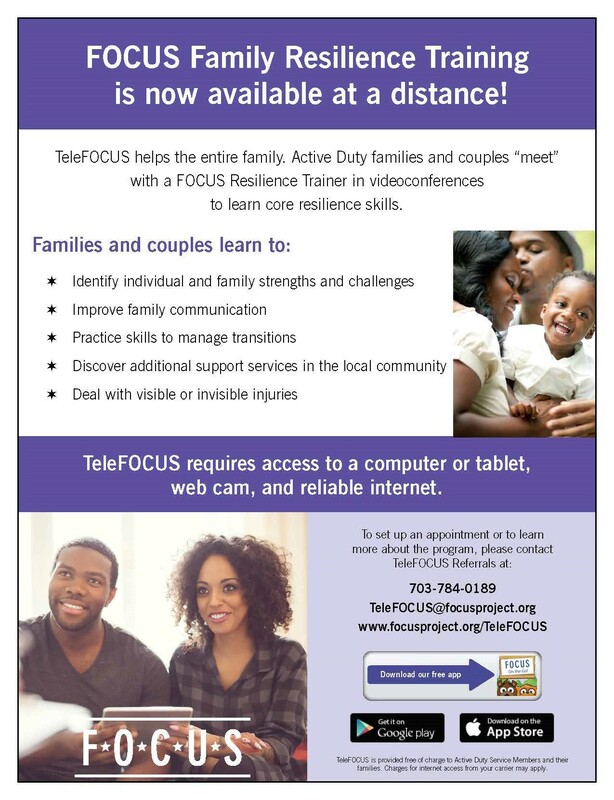 FOCUS Family Resilience Training is now available for active duty couples and families all over the world through TeleFOCUS. TeleFOCUS is a brief interactive program that strengthens family and couple relationships. Sessions include a variety of activities and exercises for children, adults, and the entire family. It uses a secure video chat program to deliver, in the convenience of a family’s home, the same program that over 12,000 military families and couples have enjoyed. Families only need an internet-connected computer with a camera. TeleFOCUS is flexible and adapts to meet each family’s goals. Families and couples do not have to be in the middle of a challenging time to benefit from FOCUS. In fact, most families report that FOCUS was a great way to build on their strengths, work together as a team, and grow even closer. TeleFOCUS teaches families skills that support resilience. These skills include communication, goal setting, managing trauma and stress, and problem solving. TeleFOCUS is open to all active duty families and couples, including activated Reserve and Guard families. Recovering warrior families and couples who are dealing with visible or invisible injuries—PTSD, TBI, depression, etc. —are encouraged to participate. Training services are free, but internet and data rates may apply depending on your service provider. To set up an appointment or to learn more about the program, please contact TeleFOCUS Referrals at: 703-784-0189 or TeleFOCUS@focusproject.org. For more information, visit www.focusproject.org/TeleFOCUS. The FOCUS program is designed for military families, couples and children facing ongoing stress and change. It is easily customized to meet the unique needs of each family, couple, or group in order to help them achieve their personal and relationship goals. These blog posts from real FOCUS Families describe their experiences with the program.